Holodomor (Famine Genocide) was a man-made famine in Ukraine that was a part of Soviet Union and ethnically Ukrainian areas near the east ukrainian borders in 1932 and 1933. 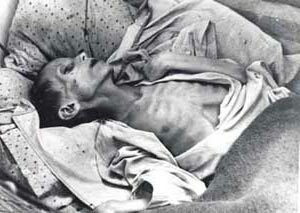 Holodomor is death by hunger, famine, during which people were consciously starved to death by Soviet komunist regime. During the Famine – Genocide in Ukraine the rate of people including children dying of starvation was 25,000 a day, 17 human beings a minute. The number of perished in a famine was 7-10 million people that was roughly one quarter of the entire population of Ukraine. The exact number is unknown because all documents in Soviet Union were secret. To force Ukraine’s millions of independent farmers (kurkuli) into collectivized Soviet agriculture was a part of collectivisation program in the Soviet Union. Farmers were told to give up their farmland, livestock, and equipment to the state, without compensation. Holodomor was the result of actions committed by the Soviet authorities, along with Soviet Dictator Stalin, in order to break the resistance of Ukrainian village complete collectivization policy and “socialist transformation ” in general. There was policy enforcement with the use of repression, grain procurement, authorities confiscating food stocks. Grain procurements in 1932 in Ukraine amounted to 400 million pounds , 1933 – 380 million pounds . This was possible due to the depletion of the village. The government took from peasants all the grain, including seed capital . The tragic events of famine covered the veil of silence. It was prohibited any assistance from the international and Soviet public. Affected by famine areas were surrounded by internal forces, which wrapped those who tried to get close to the city. Physically weakened peasantry could not effectively hold the spring sowing company in 1932 was slightly more than half of the planned area. Thus the harvest 1932 p., being slightly less than the average, would provide a minimum population of Ukraine food, but all harvest was taken from people by Stalin order and sold to other countries. Ukrainian Famine (Holodomor) 1932-1933 is considered as genocide by thirteen modern states. In 2006 Ukraine officially marks a mourning Holodomor memorial day on the fourth Saturday of November.